Ideal plan for a first look at the city. Manhattan at it’s best. 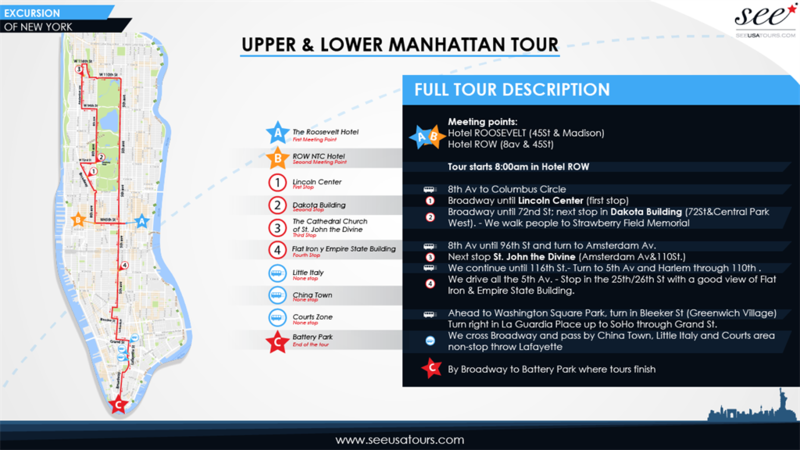 It is an orientation tour with which you can get a perfect idea of the composition of Manhattan. Our guides will show you the different neighborhoods that make up this exciting city, its quirks, anecdotes and evolution. Soho,West Village,Little Italy,Chinatown and the financial district of Wall Street. Time and pick up location: Roosevelt Hotel at 7:50 a.m and Row Hotel at 8:00 a.m, please arrive 10 minutes before.